long ago (3 years ago) , in a far away land (Orange County), there was a boy named Big A. he was only a little guy and just learning to walk. well, that boy came across some jagged asphalt that was lookin' to fight. that poor little guy couldn't stand a chance against that big mean asphalt. Big A fought fare and square but just like any sneaky villain, that jagged asphalt came from behind and tripped Big A! Big A came tumbling down and knocked a tiny tooth loose. as the years went by, that asphalt kept bullying Big A and he kept tumbling down. his poor front tiny tooth took a beating, 3 times to be exact! well, that tooth, decided to call it quits and hit the road. now Big A is a toothless tyke. and that's the end of my tiny tooth tale. true story. the hubs and i are kind of mourning for a few different reasons, 1) poor Big A didn't lose his tooth naturally and had to have it pulled due to it becoming abscess, and 2) we are now old enough to have a kid that is losing his teeth. to brighten a kind of sad situation i started pumping Big A up for a visit from the Tooth Fairy. he's pretty excited, and to make it even more special i whipped together this sweet little Tooth Fairy bag. i got the tutorial from Purl Bee. love that blog. 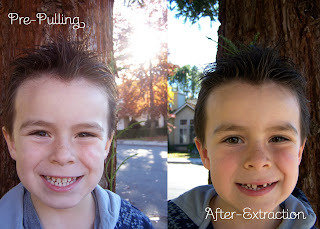 Big A is so excited that he has one less tooth and thinks he just looks so handsome, which, of course, he does. (see evidence above) he asked me on the way to the dentist what the Tooth Fairy does with the teeth she takes. the only thing i could think of was that she ground them up and turned them into fairy dust. gross, i know. but it's the only think i could think of off the top of my head. so here's a nice little sprinkling of ground up teeth for you, and you!! more stories like this please =) Maybe Big D needs to teach Big A how to stop losing fights to asphalt.